Lubrication of the ship steam engine crankshaft. 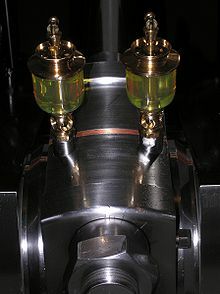 The two bottles of lubricant are attached to the piston and move while the engine is operating. Lubrication is a physical process which allows surfaces to move smoothly against each other. A thin film of lubricant put between the surfaces reduces friction and wear on the surfaces, and keeps temperatures from rising too far. The lubricant film can be a solid/liquid dispersion, a liquid, a liquid-liquid dispersion (a grease) or, exceptionally, a solid or gas. Examples are the use of oil in machinery, the function of tears in eyes and synovial fluid in joints. This page was last changed on 26 October 2014, at 17:48.